The Smart ForTwo Electric Drive is the funky, rear-drive electric coupe of choice if turning on a dime and parking in any gap is your thing. The rear wheels are driven by an 80hp electric motor connected to a single-speed transmission. 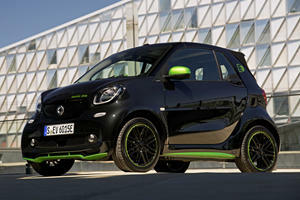 The 17.6kWh battery that charges to full capacity in 3 hours on a 240-volt system, and carries the ForTwo up to 80 miles. Available features include a panoramic sunroof, rain and light sensors, and heated seats. Safety features include ABS, ESP, and cross-wind assist. Electric cars are everywhere these days; every brand offers one in an effort to provide some sort of compliance for a greener, electric future. But for some, size still matters, and driving something the size of a Focus Electric or Nissan Leaf is just too much. 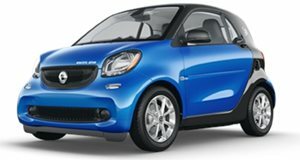 You could always drive the cutesy Fiat 500e, or there’s the Smart ForTwo Electric Drive Coupe. It’s the electric version of Smart’s smaller model, based on a rear-wheel drive platform it shares with the European Renault Twingo, and is Mercedes’ answer to the compact city car that BMW offers with Mini. As its name might suggest, the Smart Electric offers seating ‘for two’ in its cozy cabin housed within the Tridion safety cell chassis. The seating position is upright, but the seats are pretty comfortable – if offering little support around corners. Once perched, leg room is ample, head room is fantastic, but shoulder room is a little on the cramped side – especially for broader occupants. A touch screen infotainment system pairs to Smartphones for most functionality and a single digital gauge cluster displays necessary info in a difficult to read graphic setup. With no engine up front – even gasoline models are rear-engined – visibility is exceptional to the front and sides. Rearward, it’s a little difficult to see everything, but considering the rear of the car is less than two feet behind you, it matters little. But because the tailgate is so close, cargo capacity is minimal – 9.2 cubic feet, or if you stack to the roof, 12.2. When you own a Smart ForTwo Electric Drive, the city is your playground. With its diminutive 106.1-inch length and minute turning circle of 22.8 feet, you can access and park in gaps that to anyone else would be impossible. But the maneuverability isn’t matched with a great feel for what you’re doing, as the electric power assisted steering offers little to no feedback and the aggressive self-centering is a bit unnerving. The tiny wheelbase has a downside though, as it’s barely long enough to get over a pothole without being fully submerged. Over anything more than tiny bumps, it hops and leaps, and the excessively firm springs don’t deal well with anything other than smooth city streets. Over broken tarmac, it’s nervous and bouncy – so it’s best to keep the ForTwo Electric Drive in the city where it’s most comfortable. Just like the gasoline powered Smart, the Electric Drive features all drivetrain components in a mid-rear mounted position. They comprise a 17.6kWh lithium-ion battery pack and an 80 horsepower electric motor with 118 lb-ft of torque. The motor drives the rear wheels through a single speed gearbox. 0-60mph takes 11.7 seconds, but a full charge takes substantially longer – 3 hours on a 240-volt system, or 16.5 hours on a 120-volt. 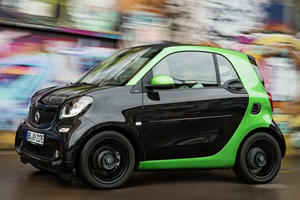 Smart claim a range of up to 80 miles for an EPA rated 134/102 MPG equivalent on the city and highway respectively. The ForTwo Electric Drive is available in a three trims – Pure, Passion, and Prime – available in a range of colors with versatile customization. Standard features include automatic climate control, a rear-view camera, and power windows. Optional features include heated seats, a panoramic sunroof, heated power adjustable mirrors, retractable cargo cover, and park assist, with leather upholstery on the Prime model. In the way of safety, the ForTwo scores 4/5 stars in NHTSA testing, and scored best available Good rating in the side and moderate front overlap tests. Safety features include ABS, ESP, and cross-wind assist. The Tridion safety cell ensures a strong body structure. 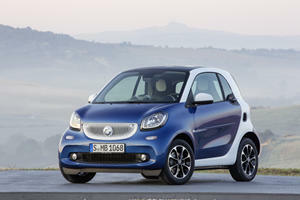 The Smart ForTwo Electric Drive is a city car by nature. Keep it within those confines on slick city streets and it lives up to its intended purpose brilliantly. But if you’re planning on driving vast distances outside of city confines, other EVs like the Chevy Bolt are vastly better. Is The Smart Brand Completely Doomed? Or can it be saved somehow?